This weekend we continued our quest for the PERFECT Brownie…and low and behold look what we found! This is now one of my absolute favorite deserts of all time. I have to say my favorite mash-up of all time is Peanut Butter and Chocolate, and this recipe takes the cake for best PB and Chocolate combo. When I was a kid and looking for something sweet, and we needed a grocery trip, I would search the cupboard for the Hershey’s Cocoa box in the spice cabinet. We usually had the basics for their brownie recipe, and it was one of our go to’s. So, this weekend I decided to dig it back up and give it a try…but this time I wanted DECADENT so I thought I would add a little twist! In addition, you will need about 3/4 c. peanut butter, and Reese’s Mini Peanut Butter Cups. Here’s where I added the twist. 3. Bake 20 to 25 minutes or until brownies begin to pull away from sides of pan. Cool completely in pan on wire rack. Cut into squares. About 16 brownies. After the brownies are done, let them cool for about 15 minutes. When brownies are still slightly warm, sprinkle Reese’s Mini Peanut Butter Cups over the top of the brownies. I push each cup into the top layer of the brownie so they sink into the top a bit. Cups will melt a bit, so place brownies in refridge or freezer until cups are reformed and firm. I’m telling you, I’m having a hard time staying away from these amazingly delicious brownies! Still searching for the perfect plain old brownie, but this one is a keeper! Those look chewy, Lindsay! 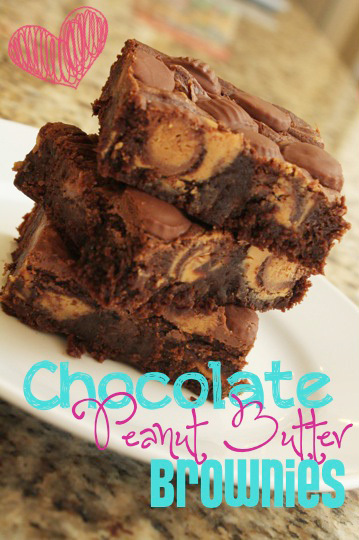 I love brownies and the peanut butter just adds more love to it.